Ontario is definitely at the heart of current controversies over wind farm siting. While an environmental tribunal ruled against a health-based appeal in July, allowing the 8-turbine Kent Breeze Wind Farm to continue operating, many of the same issues will soon be argued in court. A local family that lives just over 1.1km (just under three quarters of a mile) from the nearest Kent Breeze turbine has filed suit against three companies behind the project, saying that since the wind farm went operational in May, they’ve suffered from vertigo, nausea, and sleep disruption, and more to the point, that the developers knew this could happen. In essence the Tribunal ruled that existing Provincial siting rules are sufficient to meet the threshold it imposed; these rules call for at least a 550m setback from homes, about half of what the family filing suit is living with. As reported in detail on AEInews at the time, the Tribunal report is a fascinating overview of the current state of the wind farm noise issue, with long summaries of expert testimony from both sides. The tribunal, while affirming the value of ongoing research into health effects and the nature of wind farm noise, ruled that the more cautionary evidence remained “exploratory,” rather than “conclusive,” and set a threshold for ruling that would require that the wind farm “will” cause “serious harm.” Short of that, the Tribunal ruled that it could proceed. It seems likely that the court will be asked to review much of the same conflicting testimony; I am not sure whether the legal thresholds are different there than in the Tribunal process. The Maine Board of Environmental Protection has approved new wind farm noise standards that will lower night time noise limits to 42dB at the property line of any nearby homesites, a 3dB reduction from the old standard. The daytime limit of 55dB remains unchanged. Community groups, which initiated the review with a formal citizens proposal, had encouraged a standard of 35dB. The new rules will need to be approved by the state legislature in January. The new rules also include detailed procedures for measuring noise and establishing compliance with the noise limits. In the fine print, there is one provision that appears to add noise protection for neighbors, and some that raise questions. The additional protections include a 5dB penalty if there is moderate blade swich (amplitude modulation) present; any repetitive pulse of sound of 5dB or more will trigger this penalty, meaning the average sound will then need to be 50dB during the day and 37dB at night. 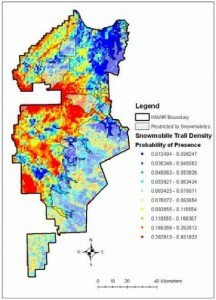 The new guidelines set a 40dB noise limit, reduced to 35dB in areas of “high amenity.” It may be of interest to note that the Victoria planning authorities seem to equate 35dB to about a 2km setback, whereas an Oregon noise standard of 36dB has more often led to roughly half-mile, or 1km, setbacks. It appears that the noise modeling is using different parameters in Oregon than in Victoria. It’s also possible that the 2km buffer is designed to protect “visual amenity,” with the noise limit being a secondary feature of the guidelines. Already, some wind farm developers have cancelled plans to build in Victoria, while locals who have experienced quality of life or health impacts praise the moves. I was especially struck by the reports of Adrian and Helen Lyons, who have 15 turbines within about 3km of their home, with the closest about 1.7km (just over a mile) away; both have reported a feeling of sustained pressure in their ears when the wind comes from the north. The ear pressure has disturbed their sleep. This spurs my ongoing question as to whether some of the physical sensations may have more to do with air pressure downwind of turbines, rather than noise levels. To my knowledge, factors creating pressure differentials have not been investigated, although the related investigation of turbulence effects is on the research agenda of agencies and companies seeking to optimize turbine layout in wind farms. See this site to download the new Victoria wind planning guidelines. Or, see this Advisory Note summarizing the new amendments, and this PDF of the full planning and policy guidelines. 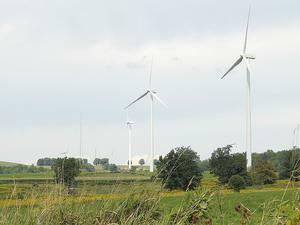 The Willow Creek Wind Farm has been given a reprieve from needing to address noise violations, as the Morrow County Court (the local name for county commission) decided not to enforce the state noise law. Oregon has some of the most stringent noise standards, 10dB over night time ambient, which amounts to a noise limit of 36dB; the commissioners decided that the noise violations were minor and rare enough that they would not enforce them, a decision that was largely spurred by the fact that the state has abandoned its noise control enforcement efforts in 1991, leaving enforcement of the state standard to local authorities. As covered previously on AEInews, dueling sound studies presented very different pictures of the noise violations. An Invenergy study showed rare violations, but did not study sound at high wind speeds; a sound study by local residents showed excess noise especially at high wind speeds, with one home experiencing noise over 40db on the majority of nights. “I’m flabbergasted,” said Jim McCandlish, a lawyer for three of the neighbors, after the vote. “The county court has an obligation to protect the health and welfare of its citizens.” McCandlish said his clients’ constitutional right to due process was being denied, and said the neighbors intend to appeal the decision to Oregon Land Use Board of Appeals. The County’s actions were in part a response to a ruling by LUBA in June that questioned the county’s interpretation of the 36dB noise limit. 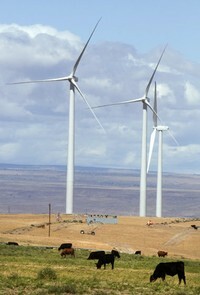 In its ruling, LUBA sided with the wind developer, which had said that the state laws allow wind farms to produce up to 10dB more than ambient sound levels; the county had been suggesting that if the developer doesn’t conduct ambient noise studies before construction, they must assume ambient of 26dB. The LUBA decision said that this requirement to choose whether or not to do an ambient study prior to construction did not appear in the state rules, leaving room for companies to show later that measurements of turbine noise levels exceeding 36dB were made when the ambient was above 26dB. Two recent articles in trade magazines caught me up on efforts taking place within the wind power industry to reduce the noise levels of wind turbines. While it’s great to know it’s on everyone’s mind, it also appears that so far, noise reductions are modest. As the so-called “low-hanging fruit” of land with good wind and transmission access gets used up and wind turbines move closer to residential areas, noise concerns are expected to become more prevalent, according to wind turbine manufacturers. GE’s sound power management (SPM) works by optimizing control setting based on real-time wind conditions, according to Sean Fitzgerald. The SPM option can be configured for day and night modes, at angular intervals depending on the mode switching and based on wind turbine placement. “These applications enable the customer to specify the appropriate, desired sound emission characteristics by customizing the sound power curve to the precise requirements over the entire wind speed range,” Fitzgerald tells NAW. Gamesa’s Miguel Angel Gonzalez-Posada notes that there’s a trend of having to keep noise as low as possible near populated areas, especially at night. The Roanoke County Board of Supervisors has adopted a wind energy policy that sits on the least-protective edges of current siting standards: a 60dB sound limit, and setbacks of 1000 feet from homes. Four of the five supervisors supported the proposal, saying it would protect residents; the 60dB limit was said to be comparable to sound along US 460, a four-lane federal highway in the area. A fifth board member, representing the district where the only current wind farm proposal is sited, encouraged the board to hold off on setting absolute limits; Ed Elswick said the county should wait until it has a proposal and hire experts to weigh in “rather than grabbing numbers out of the air.” That didn’t stop him from tossing a number in the hat: he proposed that sound be limited to levels typical of rural areas, suggesting 30dB at the nearest property line. UPDATE, 10/12/11: Elswick has asked the board to reconsider the 60dB limit; it will be on the agenda at a meeting in late October. Two board members said they knew they wouldn’t change their votes; one said he wanted to hear further discussion, and the fifth board member was not present when Elswick raised the issue again. And, 26 local residents have sued the Board of Supervisors, saying that the sudden shift from a 2600-foot setback proposal to the 1000-foot decision lacked proper notice of a public hearing, and was “clearly unreasonable, arbitrary or capricious.” UPDATE, 10/26/11: The Board of Supervisors voted to not reconsider their previous decision. The area where 15-18 turbines are currently proposed is a section of hills about ten miles from Roanoke, a near-to-town rural enclave that has federal highways two to four miles in two directions, along with I-81 a few miles distant (see 2 mile scale at lower left, above). It appears that no existing ambient levels have been determined there, though it would not be surprising if some of the highways are faintly audible at the site. There may well be homes in valleys, however, where current soundscape conditions are notably free of road noise, and which will now face next-to-the-highway noise levels from turbines on ridges nearby. It is unclear at this point how many homes are close to the 1000-foot setback distance; these will be the places where the soundscape is likely to be most dramatically changed. A half-mile setback was proposed in a previous draft of the policy; this would have likely minimized the likelihood of major impacts on neighbors, though it may not have eliminated noise issues entirely. In areas such as this, it’s often hard to site wind farms without fairly relaxed noise and setback limits. Here, as in many other towns and counties, board members apparently felt that it was more important to not exclude wind development than it was to maintain current soundscape conditions in this rural enclave. A sprawling wind farm in northern New York state is the latest new installation to trigger push-back from neighbors complaining about excessive noise. The Hardscrabble Wind Project is centered in Fairfield, just north of I-90 between Syracuse and Albany; its three-dozen turbines stretch across parts of three towns, covering an area of roughly ten miles by three miles. A recent local press report summarizes the current situation: several nearby residents have complained of noise issues, leading the developer, Iberdrola, and the town of Fairfield to commission noise studies to determine what sound levels were occurring. The Iberdrola study found that sound was generally in line with the predictions made during project planning, falling below the regulatory limit of 50dB, though in high winds some recordings came in above that with combined turbine and ambient wind noise. The town study will take place this winter, when the leaves are off the trees. A look at the sound assessment documents compiled as the project was being approved offers some hints as to why this project might trigger noise complaints; several factors compound the likelihood of issues here. First is the town’s noise limit of 50dB for non-participating neighbors, which is on the very high end of regulatory limits for wind farms. The sound assessment went through several versions as the project was revised and refined; a noise analysis from March 2009 lists 25 homes where the modeled noise levels were predicted to be between 45 and 50dB; 11 were hosting turbines and 14 were not. An apparently final revised noise analysis dated December 2009 (after some site adjustments to some turbines) does not list the affected homes, but includes very detailed sound contour maps, which show well over a hundred homes sitting in the 40-50dB zone, where it can be expected that a significant minority of residents will find the noise intrusive (based on experience at other wind farms in similar communities, and on the limited research data we have available; for more on this, see AEI’s 2010 NEWEEP presentation on community responses). It all adds up to the classic conditions that have often led to problems in rural towns that are home to many residents who are not actively farming and ranching: too many homes receiving noise levels close to (relatively high) regulatory limits. A Japanese research effort that’s been around for a while has gotten a blast of media fame this week, claiming the potential to triple power generation by using a ring around the blade-swept disc that focuses wind past the blades, as well as, I think, capturing some of the energy off the blade tips. Sounds great in a headline, but as with most new turbine design “breakthroughs,” this one is early in R&D: the field trial models are only 5kw, with two 100kw, 13m-diameter, models recently erected. 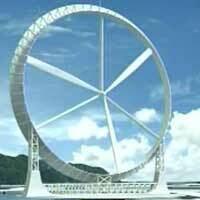 Whether the design can scale up, or be constructed economically in large arrays of smaller units, remains to be seen. The weight of the ring has to be a challenging design feature when it comes to actually building large versions of this in the real world. Nearly every efficiency-improvement approach also touts a reduction in noise output as one of the benefits.